Staying in this private studio-style cottage means that your bedroom door opens up onto the grounds of the Dunes. Leave it open to usher in all the fresh maritime air, or to welcome the sound of birdsong each morning, and the subtle chirping of the crickets at night. Along with the spacious bedroom-living room and indoor fireplace, this cottage has a full kitchen with all the modern conveniences, a private full bathroom, and your own screened-in porch with views of the river and beach dunes beyond it. Dine al fresco on the porch, or by the warmth of your wood-burning fireplace. 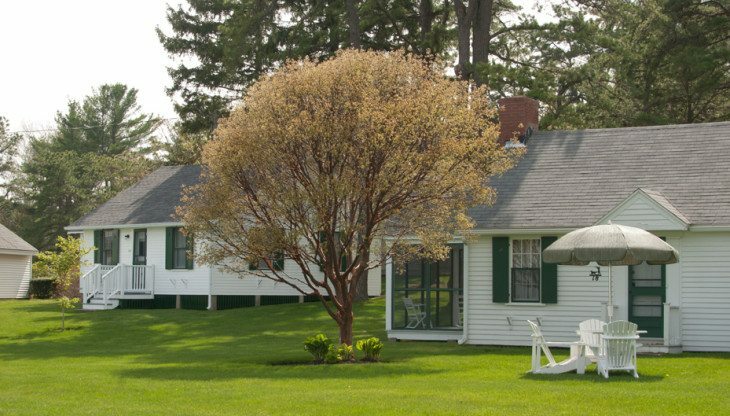 Perfect for a couple or a solo traveler, Cottage 18 is located towards the western edge of our Maine resort property with lots of green grass around it for picnicking and lounging. Cottage suites, like #18, require a minimum one week stay in mid-June, July and August (Saturday to Saturday) and a three night minimum stay at all other times.